For the last three or four years, I’ve been joining a group of friends to go camping and hiking over a long weekend on various trails and in various state and national parks around the Southeast. We usually hike around 15-20 miles over the course of each excursion and carry our gear with us as we go. We’ve done a good job of getting a trip together right at about every six months or so, which is frequent enough for me to have put some thought into how to optimally prepare for each hike. 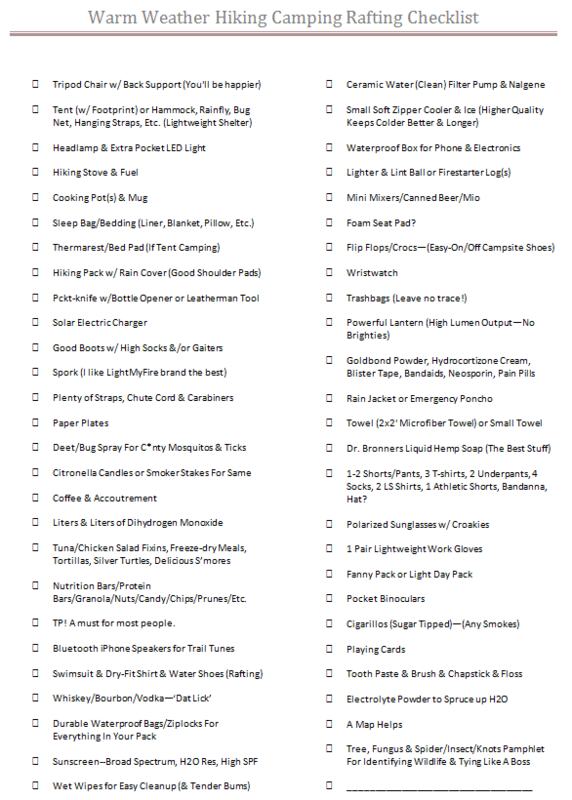 One thing I’ve learned is that being in deep woods without the right gear is just the pitts, so I started a camping/hiking checklist about three trips back to avoid those inevitable packing and memory gaffes that we’re all prone to. I’ve crafted it into what I think is a pretty definitive list and I’d like to share it with the Internets so that others may benefit from my experience. *When packing for a “long-distance” backpacking trip, keep in mind that the lighter your pack is, the better–so when you pack your supplies, you should gauge how much of each item you bring based on need and duration of your trip. Over-packing adds unnecessary ounces and unnecessary ounces add up to unnecessary pounds. And Unnecessary pounds strain your joints, chafe your shoulders and make your feet ache. With that in mind, enjoy!